The Reds are ready to get back on top in the Premier League fir the upcoming 10/11 season - now they have all the gear they need. 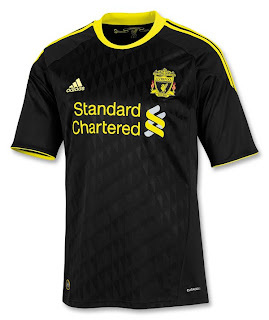 A mix of tradition and innovation - Liverpool's third jersey is traditional black with sublimated jacquard pattern throughout and modern yellow accents on sleeves and crew-neck collar. This shirt also features a new two-color Liverpool placed team badge: the full color flames pay tribute to those faithful fans who are no longer with us.